OUT of the gate it must be stated clearly: this site is no stranger to the ins and outs of leftist academia. Mind you, relative to American and Israeli academia, it is impossible to blow smoke in this direction. Don’t even try. Yes, more than up to speed, to say the least. A very familiar terrain. Minefields galore. IN tandem, being an expert in the Muslim Brotherhood and its attendant Islamic jihadi arms, this investigative journalist is called upon for many things, some of which reaches these pages, while others must fly (for sundry reasons) under the radar. Regardless, a documented trail can be found to some of what has been uncovered. THUS, it was hardly surprising when a recent request indirectly landed herein from “Two Million Bikers” (https://www.facebook.com/2MillionBikersDC?fref=nf ) , a deeply patriotic organization. It was related to a shout out they received from a prof at Marymount Manhattan College, a liberal arts college in the heart of left-wing NYC. Don’t fall off your chair, yes, there are still some profs who aren’t drinking the kool aid, and they are seeking to teach requisite lessons from experts in Islam + jihad. And, as a tidbit, the college’s location hits close to (a previous) home, though currently living in Israel and across the world. 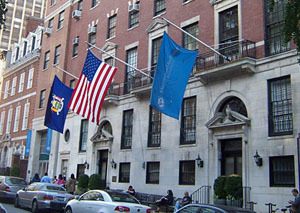 Its locale, the upper east side of NYC, is more than familiar; a personal and professional stomping ground for years. IN this regard, while Marymount’s prof turned to the Two Million Bikers, they, in turn, (through another party) were sent to this investigative journalist, hoping to line up the expert of all experts on Islam + jihad, Dave Gaubatz. A circuitous route, but that’s the way it shook out. No matter. AS anticipated – having yet to say no to any request made from these quarters – Dave Gaubatz graciously agreed to present a two-session seminar, traveling from Virginia to NYC to accommodate. Most significantly, the prof was given his full-blown bio (a true American hero), as well as the bonafides of his sponsors. Absolutely, approval was granted to discuss the (urgent and non PC) materials presented. In other words, nothing was left to chance, since all involved knew very well what it meant to enter the academic (so-called) lion’s den. Similarly, upon arrival on campus, the prof was apprised that a video would be taken. In essence, the program was set…or so they believed. IN any case, Dave Gaubatz, in tandem with a top leader from the Biker organization, as well as 2 Board members from Israel’s Voice (who happen to be the co-creators of Islam Exposed), traveled to Marymount Manhattan College on December 11, 2014. BUT before we proceed any further, again, it is intrinsic to note that the prof approved of the program and set up. It was understood that a video would be filmed (and utilized) at the behest (and discretion) of the 2 organizations cited above. REPORTEDLY, as the event progressed, a particular Dean was seen pacing in front of the classroom window, and he was visibly agitated over this and that. Pray tell, what was his problem? Well, obviously, the hot topic of Islam, its relationship to worldwide jihad – plus attendant western dangers – was just too much for his liberal bias to “tolerate”. So what did he do? Instead of directly addressing his colleague, the aforementioned prof, he called out the seminar’s sponsors and remonstrated (read: bullied) them, as if they were delinquent children! Can you imagine the utter chutzpah? Please do. NOW, per their own official record, the following are Marymount’s video guidelines. But this is aside from the fact that permission had already been granted (to videotape) by the prof, hence, she operated as the school’s representative and fiduciary. The protocol should have been clear, even for an outraged and heavy-handed Dean. You think? “If, however, an individual is photographed and/or recorded in video while in a public space and is recognizable in the photograph or video, a Release Form should be obtained if the photograph or video will be distributed or published to organizations outside MMC or posted on the Internet. It is important to obtain a Release Form from all individuals that are clearly depicted in any photograph or video that will be used in any form of advertising, including but not limited to use on a publicly available MMC website or in any development materials. EGREGIOUSLY, the above guidelines were ignored by the Dean. Hmm. At the same token, it became obvious – at least to the invited guests – that his behavior was not only outrageous, but selectively biased. To top it off, as mentioned, he went against the institution’s own (standard) video policies! Understood? CONCOMITANTLY, the query becomes: could there be one set of rules for PC speakers, but another for topics designated “out-of-bounds”, even when a resident prof invites the speaker and sets the topic? Rhetorical. BOTTOM LINE: tragically, too many campuses can no longer be considered places of free inquiry. Indeed, when certain restrictions – on topics too hot to handle – are speciously (mis)handled by the PC “police”, the closing of the American mind is not far behind. SIMILARLY, what else can one conclude, when a college admin not only embarrasses his own prof and invited guests, but engages in heavy-handed tactics, almost as if spoiling for a fight in a bar room brawl? To add insult to unforgivable injury, he excoriated, threatened, a Board of Director from Israel’s Voice: if any video surfaces of the event, yes, the college will sue and that is that! Besides, the out of control Dean went so far as to get in the Board of Director’s face, so to speak. To what end? STIPULATED, American academia is a PC cesspool! This entry was posted in Uncategorized and tagged "GENERAL CAMPUS AND EVENT PHOTOGRAPHY AND VIDEO, "Two Million Bikers", Dave Gaubatz, documented trail, http://islamexposed.org/2014/12/16/u-s-liberal-arts-college-stifles-islamic-truth-tellingdeans-heavy-hand-at-marymount-manhattan-collegecommentary-by-adina-kutnicki/, http://joeforamerica.com/2014/12/u-s-liberal-arts-college-stifles-islamic-truth-telling-deans-heavy-hand-marymount-manhattan-college/, http://www.thelibertyeagle.com/u-s-liberal-arts-college-stifles-islamic-truth/, https://cair.com/press-center/cair-in-the-news/7518-3-years-later-more-muslims-getting-politicial.html, https://www.facebook.com/2MillionBikersDC?fref=nf, Islam Exposed, Israel's Voice, leftist academia, MUslim Brotherhood, www.wearenotafraid.blogspot.co.il by Adina Kutnicki. Bookmark the permalink. Veritas odium parit , The truth begets hate! Pingback: Israel's Voice | ALERT: AQAP (ISIS’s Parent) TOP Leader Threatens America. Listing of U.S. Islamists, Material Supporters! Pingback: Israel's Voice | U.S. (Leftist) Academia UPHOLDS Incitement To Murder! Israel/Jews Favorite Target. Parents/Students Beware, Recommended Push-Backs.